Anesthesia for day-care (ambulatory anesthesia) surgeries may require administration of general, regional, and local anesthesia or monitored anesthesia care supplemented with sedation. The advancements in anesthesia techniques and availability of newer drugs have contributed largely to the progress of day-care surgery. However, provision of day-care anesthesia services is a challenging task. The main challenges include the logistics and organization of the day-care setup to make it function efficiently, effectively, and safely.,, These difficulties are accentuated in resource-challenged settings. The first novel attempt to describe ambulatory surgery is largely attributed to a Glasgow Hospital surgeon, Dr. Nicoll who reported a series of more than 9000 patients undergoing day-care procedures. The day-care procedure-based hospital teaching was first introduced in 1962, whereas an exclusive ambulatory surgery hospital was first created in 1969. The formal development of ambulatory anesthesia came into an existence with the establishment of the Society for Ambulatory Anesthesia, “SAMBA,” in 1984 along with the starting of postgraduate subspecialty training program. Among developed nations, 66% of surgical procedures are performed on outpatient basis in the United States, whereas 50% of the surgeries in the United Kingdom are performed on day-care basis with an ambitious target of 75% over the next decade. Nonuniform reporting of data from developing nations like India makes it extremely difficult to gauge the progress of this subspecialty of anesthesia in these nations. However, from the available data from an unpublished source, it can be stated that 11%–23% of the surgeries in India performed in hospital settings are on outpatient basis. 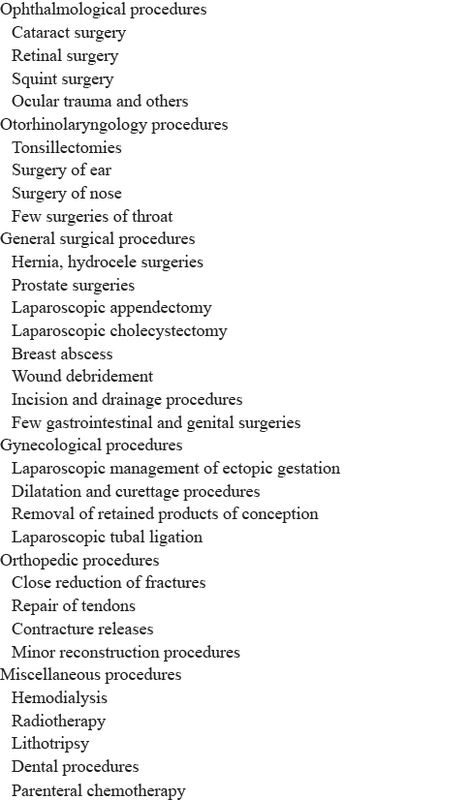 The majority of surgeries are performed by ophthalmology, otorhinolaryngology, gynecology, and general surgery specialties [Table 1]. Contribution to the economic growth of the nation. Higher anxiety levels among patients. Ambulatory surgical patients are managed in the same surgery facility as inpatients. 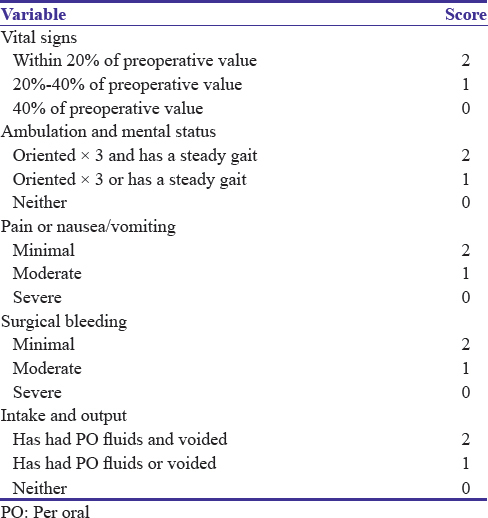 Outpatients may have separate preoperative preparation and recovery areas. A separate ambulatory surgical facility within a hospital handles only outpatients. These surgical and diagnostic facilities may be associated with a hospital or medical center but are housed in separate buildings that share no space or patient care functions. Preoperative evaluation, surgical care, and recovery occur within these autonomic units. In developing nations, majority of nursing homes and smaller hospitals function in this manner. These operating or diagnostic units are managed in conjunction with physician's offices for the convenience of patients and health-care providers. Availability of physician/surgeon for 24 h is an essential prerequisite in case of any emergency readmission. Renal and hepatic diseases are not considered as contraindications for day-care surgery. As such American Statistical Association III-IV patient can also be taken up for elective surgery provided, they meet fitness criteria laid down for the day-care anesthesia. Surgical factors are important determinants for deciding the fitness of patients for day-care ambulatory surgery. Elective and emergency surgical procedures have to be individualized on patient-to-patient basis. Surgical procedures with high propensity for cardiovascular instability, hemorrhage, postoperative nausea and vomiting, delayed start of oral intake, etc., are not suitable for day-care anesthesia. Rather, only those surgical procedures should be chosen which allows early oral intake and ambulation. Anesthetic technique has to be modified and titrated to a level so as to provide optimal anesthesia with minimal side effects. The present recommendations state that clear fluids can be administered up to 2 h before surgery without increasing the gastric volume. Routinely, administration of metoclopramide and H2 blockers is immensely useful in ensuring minimal residual gastric volume and acidity. Newer airway adjuncts such as proSeal laryngeal mask airway, Combitube, and others have revolutionized the noninvasive airway management in day-care surgeries. GA is the most common method and can be administered either by inhalation or intravenous methods as well as a combination of both can be considered. Inhalational anesthesia with traditional agents such as ether, nitrous oxide, halothane, isoflurane, and others is a thing of past now. With the advent of modern anesthesia workstations and development of advanced vaporizers, inhalational anesthesia has also made huge leaps of progression. Sevoflurane and desflurane have maintained the place of day-care ambulatory anesthesia in modern day anesthesia practice; however, widespread usage of these agents is somewhat limited by their high procurement cost. Regional anesthesia has gained a widespread popularity in day-care surgical procedures recently. However, prolonged recovery time for complete regression of the block lengthens period of postoperative period care. Bier's block is still the gold standard in many procedures, especially pertaining to forearm. The advent of safe local anesthetics such as levobupivacaine and ropivacaine and the reduction of dosage of these local anesthetics with adjuvants such as dexmedetomidine and clonidine have made Bier's block an extremely safer procedure in modern day anesthesiology practice. Availability of newer ultrasound equipment in the past decade has given an impetus to peripheral nerve blocking procedures. Not only the block is administered with precision but also the dose of local anesthetic is also decreased remarkably. Even procedures such as shoulder arthroscopy have become possible to be performed on day-care basis. Local infiltration of anesthetics at incision site is an extremely simple procedure for providing effective postoperative analgesia. This is being increasingly employed even by the nonanesthesiological fraternity as well, especially in the ophthalmological and ENT surgical patients. Infiltration of port sites with local anesthetics in laparoscopic procedures also provides pain relief to a good extent in the early postoperative period. Huge stress has been made in the past on “3M,” that is, minimum mandatory monitoring during day-care surgery. However, there is no universal consensus on which parameters to be monitored strictly during such procedures besides heart rate, noninvasive BP, pulse oximetry, and electrocardiogram. In resource-limited settings, it is difficult to monitor end-tidal CO2 and end-tidal concentration of inhalational anesthetics. In developed nations, even bispectral index system also forms the component of minimum mandatory monitoring which is greatly helpful in maintaining the adequate depth of anesthesia, faster recovery, and minimum postoperative complications. This is the most important aspect during postoperative period as the discharge of the patient from the hospital on day-care basis is decided after evaluating recovery characteristics. Major issues before discharge such as any episode of bradycardia, hypotension, hemorrhage, emergence phenomenon, PDPH, transient neurological symptoms, pain, respiratory depression, urinary retention, shivering, postoperative nausea and vomiting, and many others which can possibly defeat the goals of ambulatory anesthesia.,, Recovery is usually divided into three stages; early, intermediate, and late recovery stage. The early stage is characterized by patient getting awake with return of protective reflexes. Patients undergoing local anesthetics are considered to have fast-track recovery. Intermediate stage starts with the patient getting admitted into the postanesthesia recovery care unit till discharge of the patient. Any complication or symptoms during this stage can be easily managed as the recovery unit of day-care surgery is well equipped and staffed. The ability to take oral fluids and self-ambulation for micturition are not considered vital criteria for discharge. Regression of neuraxial blockade beyond S3 level helps in return of micturition reflex. Late stage recovery terminates when patient fully recovers from the physiological and psychological aspects of the surgical procedure. A written set of instructions and contact number of attending doctor should be handed over to the patients and the accompanying persons during discharge and should be told to contact immediately on appearance of any signs and symptoms. Ideally, such patients should be handed over summary of general details pertaining to day-care anesthesia and surgical procedure. Numerous scoring systems such as clinical recovery score, Stewart recovery scores, Aldrete score (AS), postanesthesia discharge scoring systems (PADSSs), and others have been developed to monitor patients before being discharged safely from the hospital after ambulatory surgery., The clinical usefulness of each varies slightly with dependency on demographic and clinical factors. However, AS serves as a better method during the initial part of the recovery after ambulatory anesthesia whereas PADSSs are more useful during discharge of the patient after ambulatory anesthesia [Table 2] and [Table 3]. As a matter of fact, majority of the clinicians do not depend entirely on these rigid scoring systems. 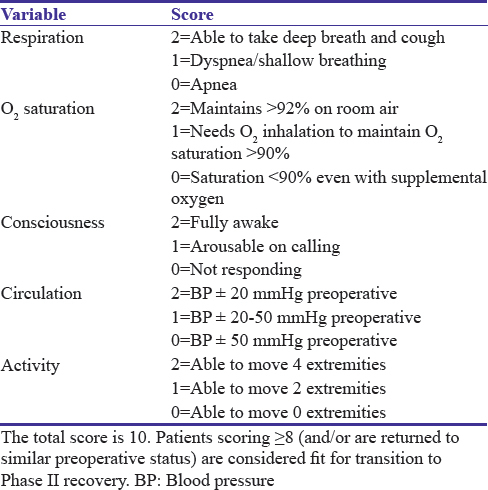 In routine practice, a mix of these scores and subjective clinical acumen is very useful in taking appropriate decisions related to discharge of the patient which include but are not limited to following factors. Above all patients should be able to understand the requirements of postanesthesia care and should follow advice as to when to resume daily routine activities. The scoring systems are just supportive parameters rather it is the clinical judgment and acumen of the attending anesthesiologist which is extremely useful in ambulatory anesthesia, especially in developing nations and low resource settings. The cost-effectiveness of day-care anesthesia can be derived from the fact that minimum workforce is required as the patients do not get admitted for the night and the short recovery times are translated into cost savings. Hospital resources are also spared which is hugely beneficial in resource-challenged settings of developing nations. Cost-effectiveness is further enhanced with setting up of audit of day-care anesthesia procedures which can improve the quality and efficiency of patient care. Day-care anesthesia and surgeries are undergoing a phase of evolution from the traditional methods. The betterment is being guided by an increased understanding of the pathophysiological basis of the disease, advancements in anesthetic techniques, adoption of minimally invasive surgical techniques, availability of newer and short-acting anesthetic drugs, and evolution of sociobehavioral and economic factors. However, many challenges are being confronted everyday and numerous barriers have to be broken before day-care ambulatory anesthesia and surgery can make its concrete place and establishment in clinical society. Association of Anaesthetists of Great Britain and Ireland; British Association of Day Surgery. Day case and short stay surgery: 2. Anaesthesia 2011;66:417-34. Gangadhar S, Gopal T, Sathyabhama, Paramesh K. Rapid emergence of day-care anaesthesia: A review. Indian J Anaesth 2012;56:336-41. Verma R, Alladi R, Jackson I, Johnston I, Kumar C, Page R, et al. Day case and short stay surgery: 2. Anaesthesia 2011;66:417-34. Blake DR. Office-based anesthesia: Dispelling common myths. Aesthet Surg J 2008;28:564-70. American Society of Anesthesiologists. Office Based Anesthesia: Considerations for Anesthesiologists in Setting Up and Maintaining a Safe Office Anesthesia Environment, from ASA Committee on Ambulatory Society for Ambulatory Anesthesia (SAMBA) Committee on Office Based Anesthesia; 2008. Available from: http://www.asahq.org/ publicationsAndServices/office.pdf. [Last accessed on 2016 Nov 16]. Naresh T. Row: Progress of day surgery in India. Ambul Surg 2010;16:15-6. Korttila K. Recovery from outpatient anaesthesia. Factors affecting outcome. Anaesthesia 1995;50 Suppl:22-8. Department of Health. The NHS Plan. A Plan for Investment. A Plan for Reform. London: Department of Health; 2000. Servin F. Low-dose aspirin and clopidogrel: How to act in patients scheduled for day surgery. Curr Opin Anaesthesiol 2007;20:531-4. Verma R, Alladi R, Jackson I, Johnston I, Kumar, Page R, et al. Guide lines – Day case and short stay surgery: 2. Anaesthesia 2011;66:417-34. Singh Bajwa SJ, Bajwa SK, Kaur J. Comparison of two drug combinations in total intravenous anesthesia: Propofol-ketamine and propofol-fentanyl. Saudi J Anaesth 2010;4:72-9. Collins CE, Everett LL. Challenges in pediatric ambulatory anesthesia: Kids are different. Anesthesiol Clin 2010;28:315-28. Joshi GP, Chung F, Vann MA, Ahmad S, Gan TJ, Goulson DT, et al. Society for Ambulatory Anesthesia consensus statement on perioperative blood glucose management in diabetic patients undergoing ambulatory surgery. Anesth Analg 2010;111:1378-87. Stocker ME, Montgomery JE. Pre-operative assessment for day and short stay surgery. RCOA Bulletin 2011;69:19-21. Smith I, Jackson I. Beta-blockers, calcium channel blockers, angiotensin converting enzyme inhibitors and angiotensin receptor blockers: Should they be stopped or not before ambulatory anaesthesia? Curr Opin Anaesthesiol 2010;23:687-90. Montgomery J, Stocker M, Armstrong I, Lipp A, Carr C, Khaira H, et al. Ten dilemmas in pre-operative assessment for day surgery: British association of day surgery handbook. Norwich, UK: Coleman Print; 2009. p. 1-34. Stierer TL, Wright C, George A, Thompson RE, Wu CL, Collop N. Risk assessment of obstructive sleep apnea in a population of patients undergoing ambulatory surgery. J Clin Sleep Med 2010;6:467-72. Bajwa SS, Sehgal V, Bajwa SK. Clinical and critical care concerns in severely ill obese patient. Indian J Endocr Metab 2012;16:740-8. Lonnqvist PA, Morton NS. Paediatric day-case anaesthesia and pain control. Curr Opin Anaesthesiol 2006;19:617-21. Kulshrestha A, Bajwa SJ, Singh A, Kapoor V. Dexmedetomidine and fentanyl combination for procedural sedation in a case of Duchenne muscular dystrophy. Anesth Essays Res 2011;5:224-6. Hutchinson A, Maltby JR, Reid CR. Gastric fluid volume and pH in elective inpatients. Part I: Coffee or orange juice versus overnight fast. Can J Anaesth 1988;35:12-5. Strauss JM, Giest J. Total intravenous anesthesia. On the way to standard practice in pediatrics. Anaesthesist 2003;52:763-77. Nair GS, Abrishami A, Lermitte J, Chung F. Systematic review of spinal anaesthesia using bupivacaine for ambulatory knee arthroscopy. Br J Anaesth 2009;102:307-15. Urmey WF. Spinal anaesthesia for outpatient surgery. Best Pract Res Clin Anaesthesiol 2003;17:335-46. O'Donnell BD, Iohom G. Regional anesthesia techniques for ambulatory orthopedic surgery. Curr Opin Anaesthesiol 2008;21:723-8. Abosedira MA. Adding clonidine or dexmedetomidine to lidocaine during Bier's block: A comparative study. J Med Sci 2008;8:660-4. Snaith R, Dolan J. Ultrasound-guided peripheral upper limb nerve blocks for day-case surgery. Contin Educ Anaesth Crit Care Pain 2011;11:172-6. Bajwa SJ, Jindal R. Use of Articaine in loco-regional anesthesia for day care surgical procedures. J Anaesthesiol Clin Pharmacol 2012;28:444-50. Mayell AC, Barnes SJ, Stocker M. Introducing emergency surgery to the day care setting. J One Day Surg 2009;19:10-3. Bajwa SJ, Gupta S, Kaur J, Singh A, Parmar S. Reduction in the incidence of shivering with perioperative dexmedetomidine: A randomized prospective study. J Anaesthesiol Clin Pharmacol 2012;28:86-91. Pavlin DJ, Pavlin EG, Fitzgibbon DR, Koerschgen ME, Plitt TM. Management of bladder function after outpatient surgery. Anesthesiology 1999;91:42-50. Dorairajan N, Andappan A, Arun B, Siddharth D, Meena M. Day care surgery in a metropolitan government hospital setting – Indian scenario. Int Surg 2010;95:21-6.